The "SpreadStone™ Countertop Finishing Kit" from Daich Coatings lets anyone transform their drab countertop into an authentic looking, high-performance stone surface - as easily as painting. 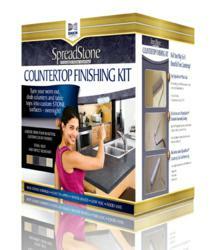 SpreadStone Countertop Finishing Kit from Daich Coatings Corp. The SpreadStone Countertop Finishing Kit delivers the decorative appeal of granite in an economical and simple-to-use package. Daich Coatings Corporation, a 20-year manufacturer of unique "stone coatings" traditionally used on concrete and other floor and wall surfaces, has developed a roller-applied stone finish that is installed directly onto existing laminate - as well as over wood, concrete and tile. The "SpreadStone™ Countertop Finishing Kit" is an all-in-one system that contains everything required to add an actual stone overlay to worn or outdated kitchen countertops, bathroom vanities, bar tops, kitchen tables, coffee tables, patio furniture and more. The product is currently offered through a network of paint and hardware stores across North America -- as well as factory-direct through Daich Coatings' own online store, aptly named "The Daich Store." Apart from the authentic granite-like appearance of the applied surface, the SpreadStone™ kit creates an extremely durable surface with excellent resistance to abrasion, impact, heat and stains – and is also food safe. The coverage rate of the kit is between 50 to 60 square feet at an average total cost of approximately $2.25 per square foot. "Real granite countertops can typically cost thousands of dollars to install — often beyond the budgets or expense priorities of many consumers," says Peter Daich, president of Daich Coatings. "The SpreadStone Countertop Kit delivers the decorative appeal of granite in an economical and simple-to-use package that's not just a faux finish or countertop paint. It's the real deal...it's stone." The 3-step kit is available in a selection of five pre-mixed colors and contains: a bonding base coat, the decorative stone coating and a clear coat which is applied last. Everything is applied with a small roller, starting with the base coat and stone layers which are installed the first day. The following day, the surface is sanded smooth prior to application of the clear coat. Overall, the entire SpreadStone™ system is complete, fully cured and ready to use in about two days. The coating components of the SpreadStone™ Countertop system are all non-toxic, low VOC, odorless and water-based. "When it comes to 'green" products, you really can't get much greener than stone," says Daich, of the formula that comprises the countertop refinishing kit. Even surfaces that have been previously damaged can be completely concealed beneath the new stone finish. Deep cracks, holes or gouges can be filled with wood filler, vinyl cement patch or drywall spackle to produce a smooth, flush surface prior to application. "If you know how to use a small paint roller, you're fully qualified to use this product and produce beautiful results," says Daich. "There are no complicated tools to master, no epoxy chemicals – and you don't need any artistic ability to get the results you want. Just roll on the stone, and clear coat it the next day. Job done." Consumers who are interested in the SpreadStone™ Countertop Finishing Kit can visit the Daich Coatings website at http://www.daichcoatings.com for more information, including a detailed step-by-step video of the installation process. Daich Coatings Corporation is a Canadian manufacturer of wall and floor paints, textured decorative wall finish systems, industrial floor coatings, water-proofing and anti-slip systems. The company is also a specialist in the formulation and manufacture of various proprietary "stone coating" technologies for use by residential consumers and contractors on exterior and interior concrete floors and other surfaces. The company was founded in 1993 and sells it's products through a network of distributors and more than 1000 retail outlets throughout North America and internationally. Most of it's offerings are water-based in composition, due to the company's long-standing goal of formulating products that are free of solvents, low VOC and odorless wherever possible. "We don't like to work with products that are hazardous, flammable or bad for the environment at our plant -- let alone sell such products to our customers," says Peter Daich, president of Daich Coatings Corporation. "We're proud to say we were a "green" coating manufacturer long before it was in style."